Cheesy scalloped potatoes with ham is the perfect way to use leftover ham. Do you want to want to make an inexpensive, comfort food recipe your whole family will love? Scalloped potatoes and ham is the way to go. 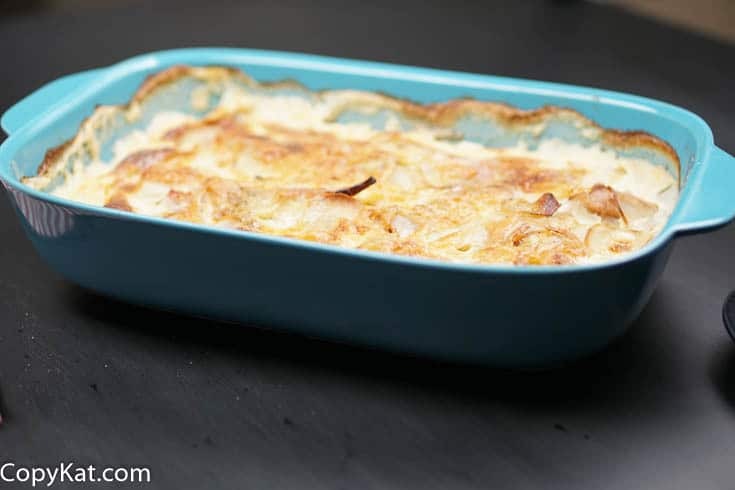 Never tried making scalloped potatoes with ham from scratch? One bite of these potatoes and you aren’t going to buy another boxed potato again. This dish is super easy to make, and it is a great way to use leftover ham or even leftover sausage. I have made this same dish with smoked sausage and thought it was amazing. I like to make this dish with Russet Burbank potatoes, these starchy potatoes mean the sauce will be thick and creamy. You could use other potatoes to make this recipe, like Yukon Gold potatoes, and Idaho potatoes would all work well. You want to use a potato that is starchy, and not waxy. Purple potatoes will work too! There is nothing better than some bits of ham in the cheesy creamy sauce along with tender potatoes. I cut all of the potatoes into a 3/8 slice. I used my Oxo Good Grips V-Blade Mandoline Slicer. It is important to be sure to cut the potatoes evenly, so they bake evenly. Cheesy Scalloped Potatoes and Ham will please your family. For this recipe, my preference on the cheese is Gruyere, Emmentaler, or even Jarlsberg. You can use any cheese that is mild in flavor and melts easily. I have even made these with Cheddar cheese. You really could use almost any cheese for this recipe. What makes this recipe extra easy ? This recipe is extremely easy because you do not make a roux for the scalloped potatoes. We will simply add heavy cream to the casserole dish and then we will top the entire mixture with oodles of cheese. Since you don’t spend the time making a roux and a cheese sauce, this recipe takes far less preparation than other recipes. Do not worry, you won’t sacrifice any flavor by taking out the step of making a roux. Top the casserole with small knobs of butter before baking. The butter will make the potatoes brown wonderfully. 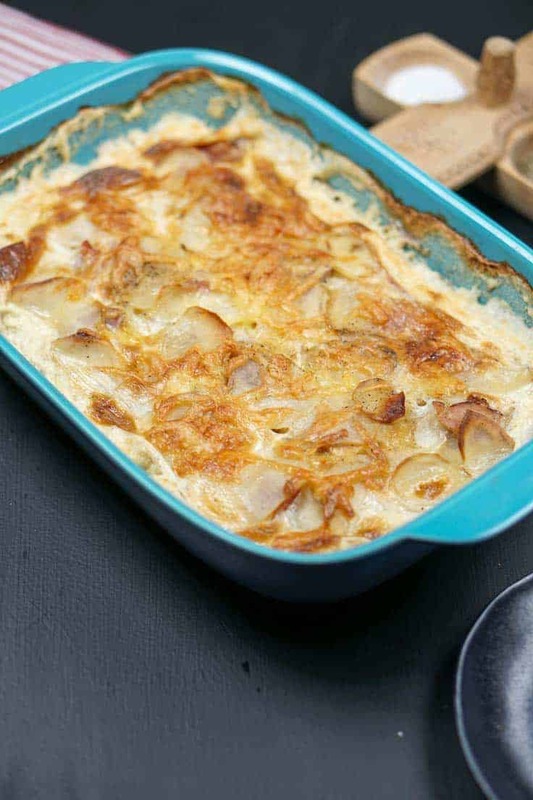 Do you love scalloped potatoes? Try more great potato recipes. It's so easy to make this potato side dish, you will never need to buy a box of potatoes again. Preheat oven to 350 degrees. Butter a 9 by 13-inch baking dish. Add a layer of sliced potatoes, and then lightly season the potatoes with salt and pepper. Add some of the ham pieces, and a light sprinkling of cheese. Repeat the layers until you run out of potatoes. Pour the heavy cream into the dish, make sure the top layer of the potatoes are covered. You may need to add more cream than listed. Bake for about 45 minutes or until golden brown and the potatoes are tender. Serve immediately. I used 8oz heavy cream and 1/2 c Half&half (ultra past/homoginized). Worked well. These potatoes were gobbled up at my family reunion. Thank you, Stephanie, I just tried this for tonight’s dinner. I made a few alterations to accommodate the ingredients on hand. I also used a 12X15 glass pan. I did rub the pan with garlic and used a family favorite, Fiesta blend Cheese. I did add Lipton Onion Soup in lieu of salt for an added flavor boost. I used evaporated milk as substitute for heavy cream when I make copycat Olive Garden sausage and potato soup. Came out very good. Family and guest liked it. Now that Dunkin Donuts will be dropping this from their menu, I’m looking for the CK recipe for their Chicken Salad! I always love your recipes. Thank you. I’m going to try this right away. Wow, no flour, sounds awesome as always!! Could I use evaporated milk instead of heavy cream?